And we're back! #TwirlerTuesday, a weekly series posted every - you guessed it, Tuesday covering, you guessed it, College Twirlers! 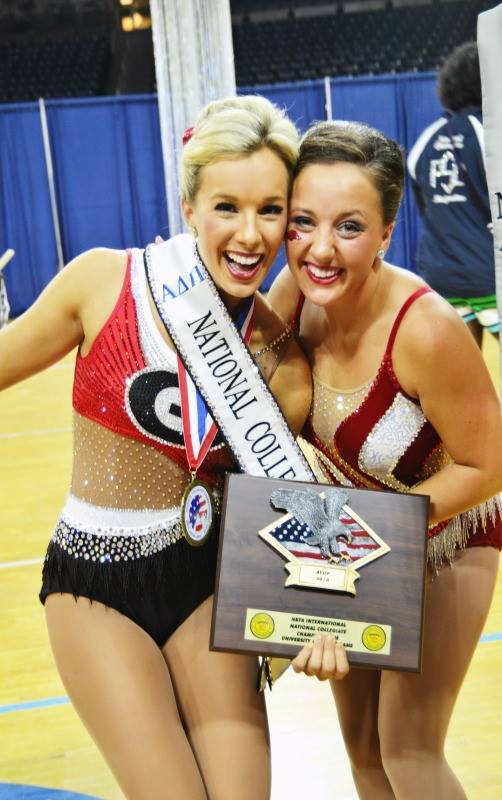 To kick off this season's series, we are proud to introduce you to the reigning National Collegiate Twirling Champion, Jameson Kenerly from the University of Georgia! Read on to hear how Jameson worked so hard to make her dreams came true. If you're interested in sharing your story, email cmbtwirl@sullivation.com. Jameson: My name is Jameson Kenerly and I’m from the small town of Jesup, Georgia. I always say that I was born holding a baton! My mom was a majorette (just a few short years ago!) at the University of Georgia and she actually taught baton and dance at her own studio when my three siblings and I were born. So I really was born right into it! I competed at my first national competition when I was just five years old and I haven’t missed a year since! I’m a Biological Science major (pre-med) in the Honors Program at the University of Georgia and am a member of the Honors Program Student Council’s Executive Board, Academic Achievement Chair of Zeta Tau Alpha, and member of Alpha Epsilon Delta Premedical Honor Society, Golden Key International Honor Society, and Order of Omega Greek Honor Society. What’s your favorite memory being a part of your college marching band? Jameson: A special tradition that UGA Feature Twirlers get to be a part of is our pregame performance. The features begin the performance alone on the center “G” of the field with our awesome mascot, Hairy Dawg! There is no way to describe the adrenaline rush that begins when the phenomenal Redcoat Band Drumline starts its drum roll… we start twirling our hearts out as the rest of the 400+ member band rushes onto the field. I will definitely always remember my very first time starting on the “G”! My sister, Adeline Kenerly, was a UGA Majorette and she was on the field twirling, too. She was watching me and told me later she started crying because she knew my lifelong dream had come true. Finish this sentence... "One time at band camp..."
Jameson: There are so many awesome memories to choose from Redcoat Band Camp! We usually practice 5-10am and 5-10pm each day (to avoid the Georgia heat!). One day, we all roll up to the fields for our last 5am practice, and our coach, Ashley, tells us to head to Waffle House for breakfast instead! We were all probably more excited than necessary, but it definitely was a fun celebration to wrap up a very tough week. Some people aren't aware of what it means to be Collegiate National Twirling Champion - tell us what it took to win the title and then what the next year looks like for you? Jameson: It’s been a lifelong dream of mine to twirl and compete for my college at the national level. So, in some ways, I’ve prepared my whole life! But in other ways, I really trained differently this past year than ever before. For one of the first times ever, I twirled completely for me and simply because I loved the sport of baton twirling! It radically changed the way I trained and I truly believed that I performed my best because I was doing it for the right reasons. I hope to travel and perform across the nation this year as National Collegiate Twirling Champion to promote NBTA and the entire sport of baton twirling. I’m especially excited to represent my favorite place in the word, the University of Georgia! When did you know you wanted to compete for Collegiate National Twirling Champion and tell us what you did to accomplish that dream? Jameson: My coach, Lori Cobb, always asks me at the beginning of each twirling season what my goals are for the days, months, and years to come. This seems like a simple task, but I took these goals very seriously and really tried to set attainable but challenging goals for myself. Of course, not all of these dreams have become reality, but I still believe I grew as a twirler and as a person by setting specific goals and striving to make them happen. Goal-setting is so important! I encourage all twirlers to write down their goals (not just for twirling, but in their academic, extracurricular, and family lives, as well) and do all that you can to make them come true. The road is definitely not always easy, but it is always worth it in the end! What advice do you have for high school-aged twirlers in deciding a school to go to? Jameson: I would advise high school twirlers to prepare early, have music edited several different lengths to meet different guidelines, have “go to” choreography ready and practice, practice, practice! Senior year of high school is so incredibly busy and preparing for college tryouts and traveling to them is more difficult and stressful than I ever dreamed. Make your routine showy and big and perform it with your whole heart! It does not have to be your hardest competition material but needs to be fun, musical, showy, and interesting to watch. Be confident! Be extremely efficient in following every single guideline the band director or auxiliary director requires of you. Submit all items on time and in a professional manner. Show them the type of “professional” person you will be if you are chosen for the position. Also, prepare for the Interview portion. Sometimes the most well-spoken, confident person will be chosen over a more advanced twirler. Best wishes to all! It’s worth all the work….it truly is the best time of my life. What is one thing that you always have to do before a game starts? Jameson: Before each performance I pray that I can glorify the Lord in the way that I twirl, perform, and interact with others. I pray that people will see His light in me. I truly realize that He is the reason that I am able to do what I love to do, so I really strive to give Him the honor and praise. If you had to live on one food for the rest of your life, what would it be? Jameson: Hmmm, that’s a tough one. If you know me, you know that I love to eat!!! I seriously have such a sweet tooth though, so anything with chocolate and sugar would make me happy. What advice do you have for other college twirlers? Jameson: “To whom much is given, much is required.” This quote has been instilled me my entire life and I truly believe it applies to all of us in some shape or form. For college twirlers everywhere, I hope that you realize what a privilege it is to represent your school and the entire twirling community. You’ve been given such a large platform of influence that you can use to inspire the next generation of twirlers. I remember vividly “looking up” to the “big girl” college twirlers and now, I guess I am one! I encourage all of us to be shining lights for all the little eyes who may be watching. I specifically remember just being “in love” with PJ Maierhofer and her huge smile when competing. I would go home to Georgia from AYOP Twirling Nationals and pretend I was her! She taught me how to tighten my core and catch my first double illusions at Harry Brown‘s summer camp. What are the next steps for you, inside and outside of twirling? Jameson: This May, I will graduate from the Honors Program at the University of Georgia with a degree in Biological Science. I will immediately begin applying to medical schools and would love to become an OBGYN that serves as a medical missionary to underserved communities. This fall will be my last season twirling for the Georgia Bulldogs. I am excited about traveling and performing at Twirl Mania as the Collegiate Classic Champion and at AYOP as the National Collegiate Champion. I can’t wait! I am just so THANKFUL. I really feel like the most blessed girl in the world. 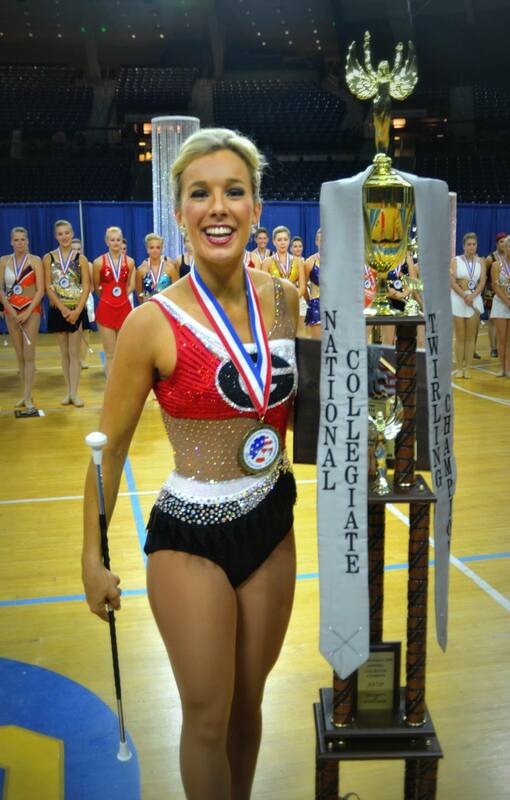 I wholeheartedly love NBTA, the University of Georgia, and the entire sport of baton twirling. Thank you to everyone who has helped make my dreams come true.